One of the unique exhibits at the Museum is the Greenback Heritage Scrapbook. The scrapbook represents an effort begun by the Greenback Community Club in 2004 to document the history of the Greenback, Tennessee area. The goals of this effort are to: collect and preserve the knowledge of “Old Timers” while they are still with us; preserve images and documents pertaining to the area’s history; and provide a means by which future generations can have access to this information. While the actual archiving and production of the scrapbook has been carried out by a relatively small group of Community Club members, the community at large has been involved in its creation by sharing old family photos, documents and newspaper clippings. There have also been a series of “potluck” get-togethers at which the community can monitor the progress being made and make inputs to the effort. The amount of material provided by contributors greatly exceeds that which can reasonably be included in book form. To accommodate the additional material, all items are being archived into a computer data base and will be preserved on CD-ROM. The scrapbook, when completed, will cover the period from 1800 to present in four or five volumes. It borrows information from several sources in addition to the contributions from community members. It is our intent that this information will provide a context for the items in the scrapbook as well as a broader picture of the overall history of the area for readers not generally familiar with Greenback or Loudon County. We have made every effort possible to credit the sources of information and to identify those who have provided the materials. 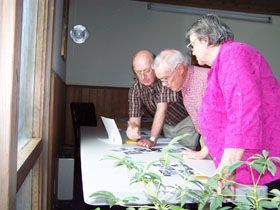 The Greenback Historical Scrapbook Project of the Greenback Community Club began on January 22, 2004 when the club voted to gather the history of Greenback and the surrounding areas. The committee thanks all of the people who donated their pictures, newspaper clippings and other information. The committee also thanks the community for their support of fund raising projects and donations to be used for printing and the preservation of this historical scrapbook. Click Here to see the Feb. 5, 2017, Daily Times article on Vol III of the scrapbook. Scrapbook Committee members waiting to check-in contributions from community participants in preparation for digital scanning. 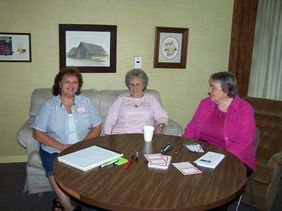 Scrapbook Committee members review material at one of several “potluck” workshops where the community shared information.